Homeschool Convention Season Is upon Us! 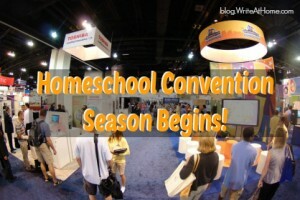 Home / Blog / Homeschool Convention Season Is upon Us! It sneaks up on me every year. In 2001, I began exhibiting at homeschool conventions to get the word out about WriteAtHome, and I’ve been to a dozen or so a year ever since. It’s a busy time with all the planning, traveling, setting up, and speaking, but I still enjoy most of it. There is always something encouraging about being around the homeschooling community and getting to engage with folks about writing and WriteAtHome. I like getting the chance to speak too, and those opportunities have increased a bit this year. If you make it to one of the shows where I’m speaking, please attend one of my workshops and let me know that you read my blog. That always pumps me up a bit. Here’s our convention schedule this year. I’ll be at many of them, but there are a few where I send a team to run the booth without me. I hope you can make it to one! Great Homeschool Convention Southeast: Greensville, South Carolina. March 20-22. I’ll be speaking at this one. MACHE: Duluth, Minnesota. April 11-12. Don Myhill and his wife Katherine will be representing us there. Don is originally from Minnesota. IDEA: Alaska. April 14-25. This trip includes stops in Soldotna, Anchorage, Fairbanks, and Juneau. I’ll be there with my daughter Taylor. Great Homeschool Convention Midwest: Cincinnati, Ohio. April 24-26. I’ll be speaking on Saturday. Our rep Angie will be there too. MACHE-MD: Frederick, Maryland. April 25-26. Don will be there again this year. CHAP: Harrisburg, PA. May 9-10. I’ll be there, but I don’t think I’m speaking this year. ENOCH: Edison, NJ. May 16-17. I’ll be there but not speaking. New Jersey is where I was born and raised. NCHE: Winston-Salem, North Carolina. May 22-24. Don will represent us here. FPEA: Orlando, Florida. May 22-24. I’ll be there with at least one of my daughters. HEAV: Richmond, Virginia. June 5-7. I will be doing several workshops here this year. Great Homeschool Convention West: Ontario, California. June 12-14. I’ll be there with my wife. THSC: The Woodlands, TX. July 24-26. Our business manager, Steve Bokmiller, and his Texas-native wife, Wendy, will be representing us in Texas this year. Put Your Grammatical Fitness to the Test! I was at the Ohio Convention but didn’t enroll while I was there b/c I was working a booth and thought I would be going to FPEA. That trip got cancelled. Can I still get the convention special? Please email me. I have 2 students to enroll (8th and 10th). Your reps were great, by the way! This is exciting news that you’re coming to Cincinnati. That’s pretty close to my neck of the woods. Hopefully I can come to hear you speak on Saturday and finally meet “the boss!” If you could let me know what time you’ll be speaking, that would be great. I’m speaking twice on Saturday. I think the earliest session: 8:30 I think? And again in the afternoon. I actually won’t get into town until lat Friday–I’ll be coming from Alaska. I’ll have someone else at the booth Thursday and Friday. Please do come introduce yourself, Mary. I love opportunities to faces to names!